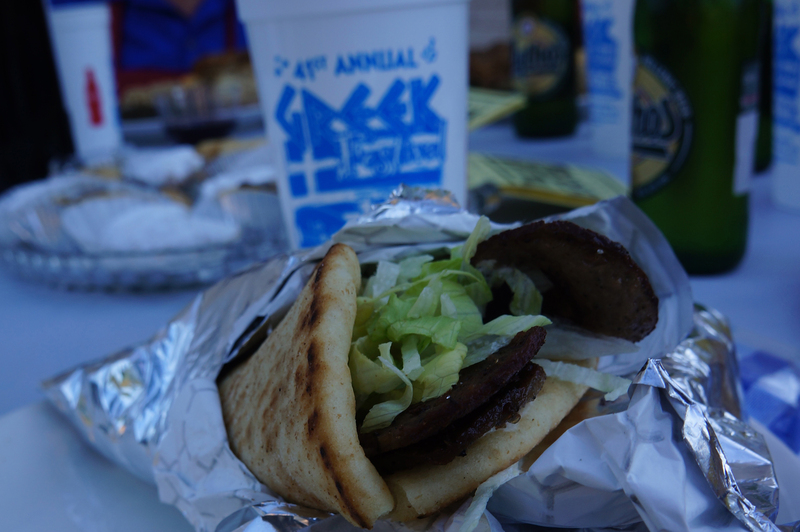 The Birmingham Greek Festival began in 1972 and is one of Birminghamʼs oldest cultural food festivals and most highly anticipated southeast event. The festival is an act of love of Birminghamʼs Greek community going back to 4 generations preparing authentic Greek cuisine. For three days you will experience the Greeks’ legendary zest for life. Besides delicious Greek cuisine, youʼll enjoy Greek music, dancing, and a warm spirited atmosphere that embraces everyone as family. As thousands of returning patrons can attest, you will leave a devoted fan. The festival offers free admission, indoor and outdoor dining, and food plates are individually priced. Be sure to stroll through The Greek Market Place which has Mediterranean and Orthodox Christian souvenirs. 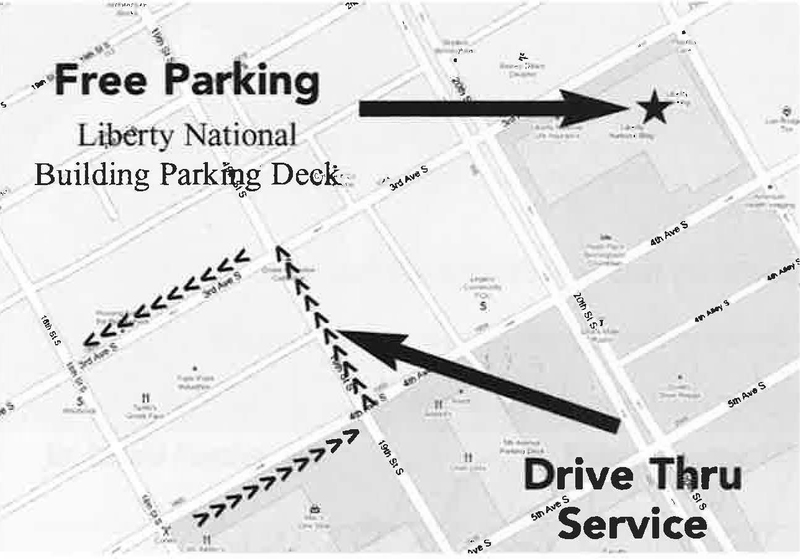 Free parking is located in the former Liberty National parking building located one block away on 20th Street (Richard Arrington Blvd) between 3rd and 4th Avenue. 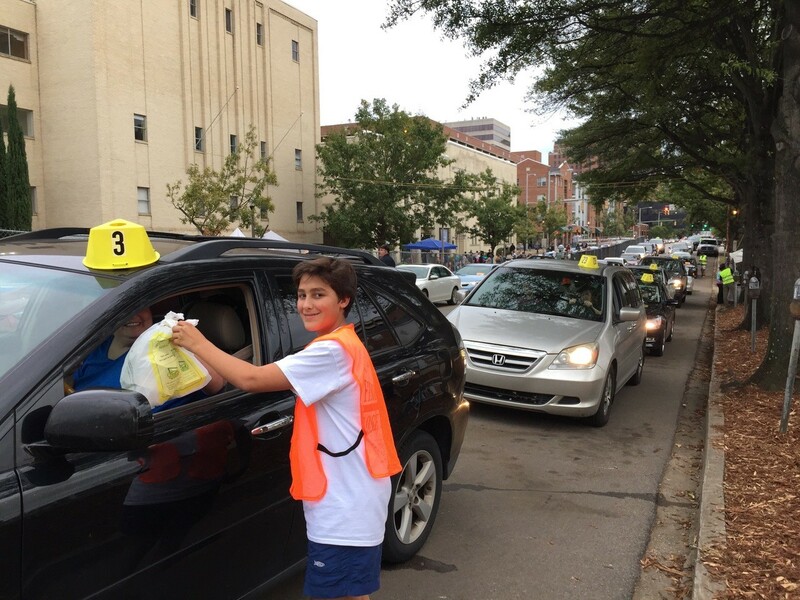 The convenient drive thru service is available all three days from 10:30am-7pm. No need to call ahead and place your order. Our servers will greet you, take your big or small order, and deliver right to your vehicle. 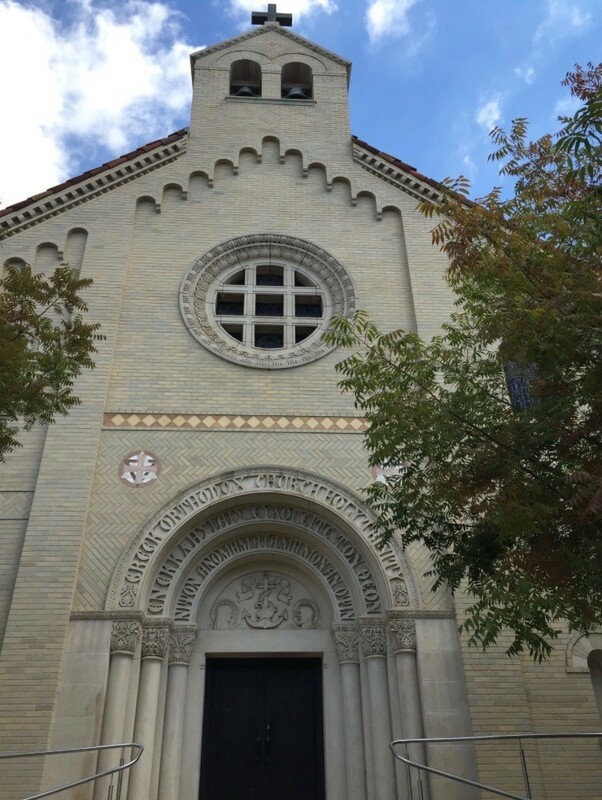 The Holy Trinity - Holy Cross Greek Orthodox Cathedral Christian Church began in 1906 and is one of the oldest Greek Orthodox parishes in the United States. The Cathedral Byzantine architecture is breathtaking so donʼt miss the chance to take a free guided tour all three days from 10:00am-9pm. Since 1972 the Festival has provided funding for many charities and ministries. In recent years, these charities have included: Magic Moments, The Bell Center, The Exceptional Foundation, The Ronald McDonald House, The Fire House Shelter, Alzheimer’s of Central Alabama, Pathways, Family Connection, The Wellhouse , Jimmie Hale Mission and The Greater Birmingham Ministries. 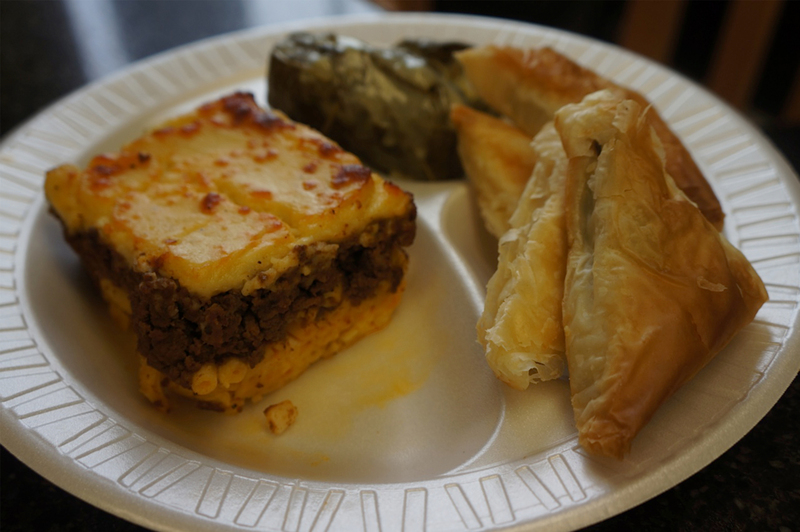 Come experience a taste of Greece without the airfare! Come enjoy traditional and delectable delights prepared by the Greek chefs of our community and served by them during the Greek Food Festival weekend. All mezzes (appetizers), entrees, and desserts are still homemade, as they have been for 45 years when the festival began, and are comprised of only the freshest and finest ingredients available. Pitas - Four filo triangles filled with feta cheese mixture or feta and spinach mixture. Dolmathes - Grape leaves stuffed with seasoned rice and topped with lemon. Deluxe Plate - Delicious Greek style chicken served with pastichio, rice pilaf, spanakopita, Greek salad, and a roll. Souvlakia - Marinated lamb skewered and grilled on an open fire. Greek Chicken - Greek-style chicken at its finest, baked and basted in a marinade of olive oil, lemon juice, and oregano. Pasticho - a wonderful combination with layers of macaroni, ground beef in a Greek tomato sauce, topped with a layer of delicious cream bechamel sauce. Veggie Plate - A meatless plate with our delicious rice pilaf, Greek dinner salad, 2 spanakopitas, 2 tiropitas, greek style green beans. Gyro Sandwich - Grilled slices of seasoned beef and lamb topped with lettuce and Greek tsaziki sauce and rolled in warm pita bread. Gyro & amp; Salad - Gyro sandwich served with Greek salad. 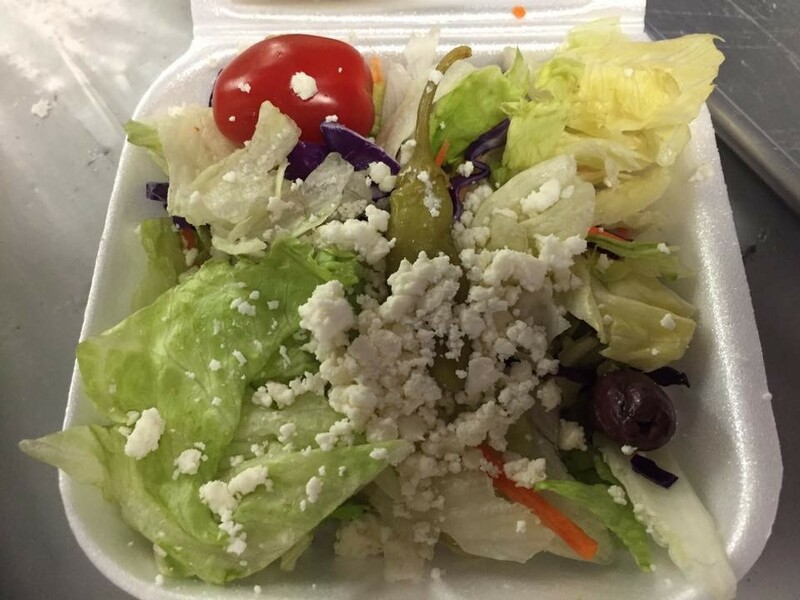 Greek Salad - Large traditional Greek salad tossed with Greek dressing and topped with feta, calamata olives, and salonika peppers. Baklava - Layer upon layer of buttered filo and ground pecans bathed in a honey syrup. Chocolate Baklava - Classic baklava dipped in chocolate. Melomakarona - Honey and nut cookie topped with chopped pecans. Kourambethes - Greek wedding cookie sprinkled with powdered sugar. Koulourakia - Butter coffee twists. 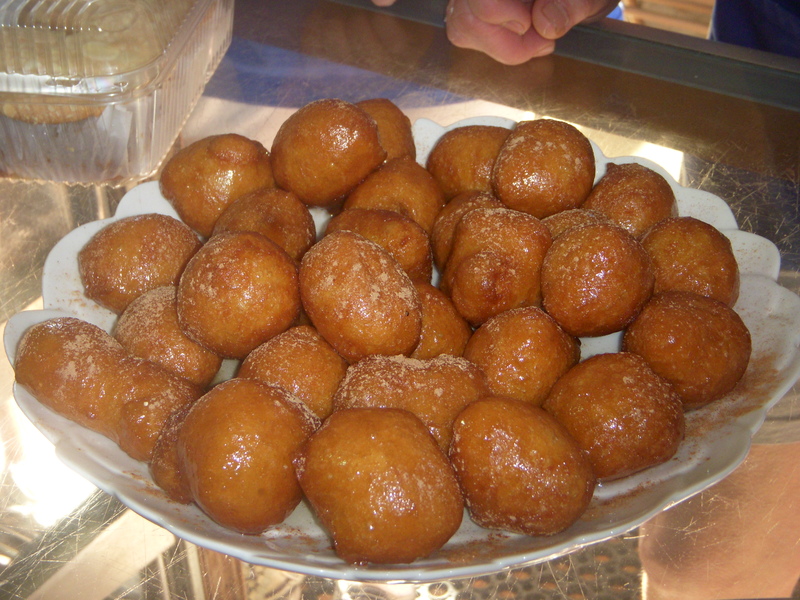 Loukoumathes - Greek fried donuts, dipped in warm honey and sprinkled with cinnamon. Almond Crescent - Almond paste filling topped with honey and almonds. Birmingham's Greek Food Festival would like to thank our Ad Book Sponsors! Beddow, Erben, & Bowen, P.A. Mikos Kampakis Ins. Services, Inc. Thank You to Our Awesome Benefactors! In memory of Miles Callahan, “We love you man!" Live Greek Entertainment Thursday, Friday, Saturday October 4-6. 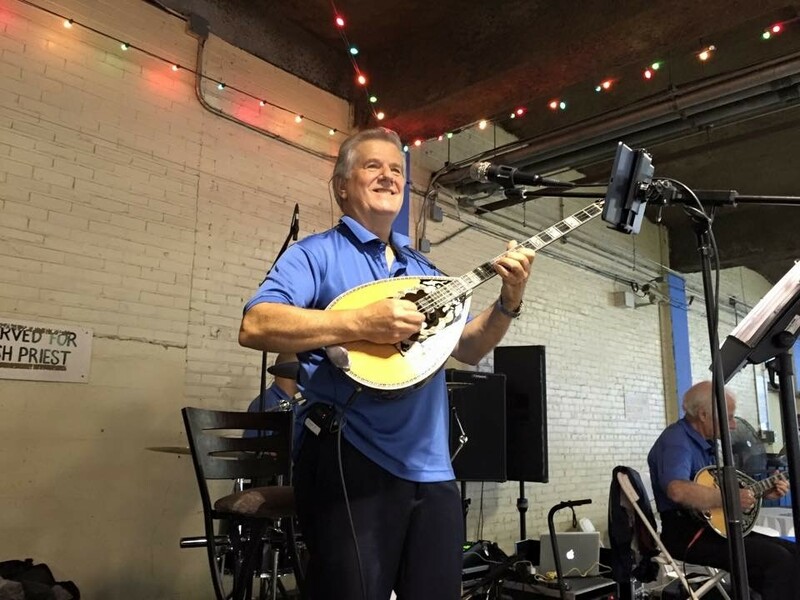 Live Greek Music will be performed by George Karras Thursday-Friday-Saturday from 10:30am-10pm. 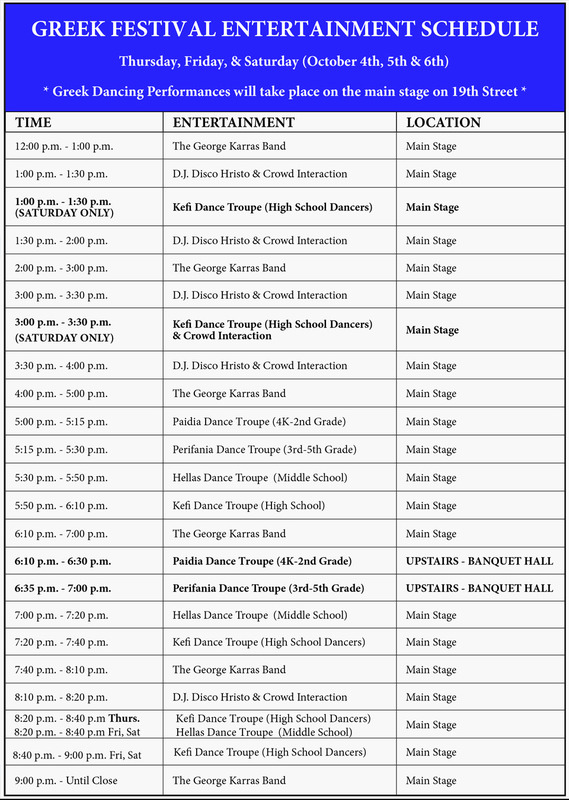 Greek Dancing Performances will take place on the Main Stage on 19th Street and inside the Banquet Hall. 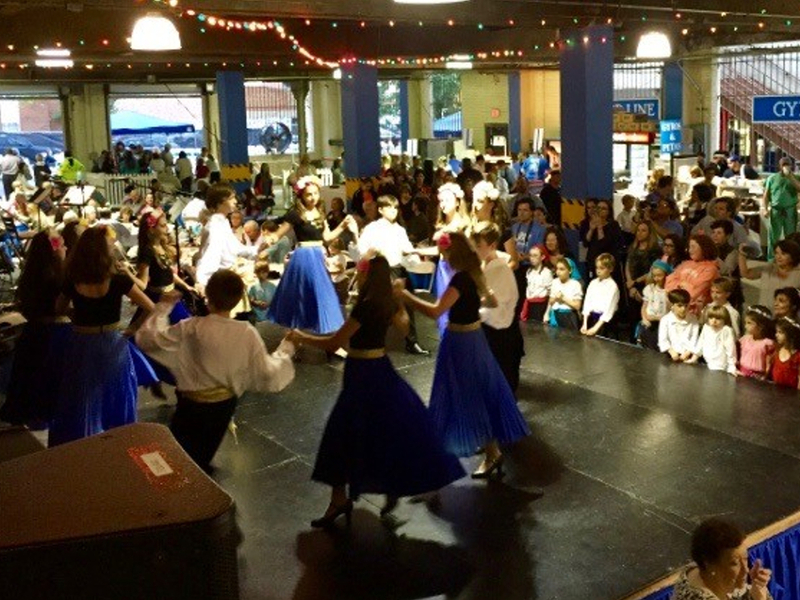 Greek dancers from ages 4-18 years old will perform Thursday, Friday & Saturday beginning at 5pm. D. J. Disco Hristo will be playing favorite Greek Music tunes all 3 days. 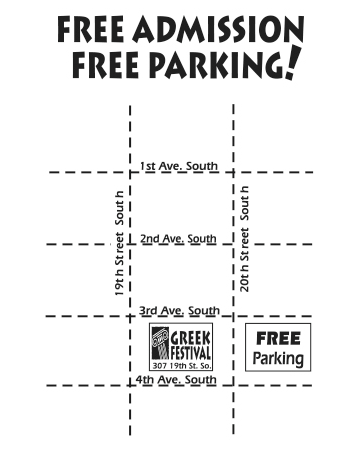 If you don't have time to attend the Greek Festival our Drive-Thru is perfect for you October 4 - 6 from 10:30am-7:00pm. No need to call ahead and place your order. Our servers will greet you, take your big or small order, and deliver right to your vehicle. The Holy Trinity - Holy Cross Greek Orthodox Cathedral Christian Church began in 1906 and is one of the oldest Greek Orthodox parishes in the United States. The Cathedral Byzantine architecture is breathtaking so donʼt miss the chance to take a free guided tour all three days from 10:00am-9:00pm. The Orthodox Church, sometimes called the Greek Orthodox, Russian Orthodox, or Eastern Orthodox Church is the first Christian Church. Orthodox Christians believe in Jesus Christ as God and in the church He established. Her history begins with Pentecost, when the Holy Spirit descended upon the apostles and gave birth to the Church as described in the New Testament. Incredible as it seems, for almost twenty centuries she has continued in her undiminished and unaltered faith and practice. Today her Apostolic doctrine, worship, and structure remain intact. The Orthodox Church is the living Body of Jesus Christ. Orthodoxy is the second largest body in Christendom with 225 million people worldwide. In the USA and Canada there are 6 million Orthodox Christians. She is the church of some of history's greatest theologians, scholars, and writers: John Chrysostom, Jerome, Augustine, Dostoyevesky, and Alexander Solzhentsyn. For those needing to stay at the SpringHill Suites Hotel during the Festival , the hotel has reserved us a block of rooms for October 4 - 6, 2018. To make reservations, please call (205) 322-8600 and ask for the "Greek Fest Room Block". CUTOFF DATE: Reservations by attendees MUST be received on or before September 1, 2018. FREE PARKING In the former Liberty National Parking Building one block away located on 21st Street (Richard Arrington Blvd) between 3rd and 4th Avenue.